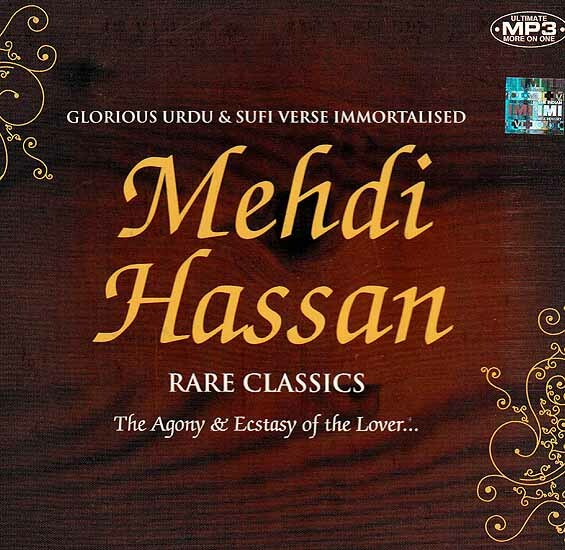 The man credited with pioneering the Ghazal performing form as is prevalent today is none other than the celebrated ghazal singer Mehdi Hassan. Born in India Rajasthan in 1927 Mehdi’s family migrated to Pakistan posr-independence. Mehdi though had been initiated into music since the tender age of 8 by his father Ustad Azeem Khan and uncle Ustad Ismail Khan who were classical musicians. His surging popularity over the last 5 decades and his mastery over classical music makes him a one-off artist with no peers. It is Mehdi sahib, who without resorting to dazzling his fasteners with fast paced rhythms sticks to soulful singing, nuancing every written word with soul-stirring emotion. His command over difficult ragas also makes him a complete composer as he uses the right ragas to embellish tunes that stand true to the mood of the Shayar’s (Poets) basic inspiration. RARE CLASSICS presents this wizard of the ghazal in his element, singing works of noted poets like Hasrat Mohani, Hafiz Jalindhari, Muzaffar Warsi, Qateel Shifai, Tabish Dehalvi, Habib Jalib, Eima Irfani and Krishan Adeeb and taking you into a world of dreams, desires, fantasies that thickly populate the world of the ghazal and the emotions associated with it.